Each organism's habitat is unique, but if a pattern linking habitats and life histories is to be established, habitats must be classified in terms that apply to them all. Moreover, they must be described and classified from the point of view of the organism concerned, rather than whether we feel the habitat is patchy or homogeneous, harsh or benign. Thus, when we say that the shapes of fitness contours reflect an organism's habitat, we mean that they reflect the effect of the habitat on that particular organism or the response of that organism to the habitat. 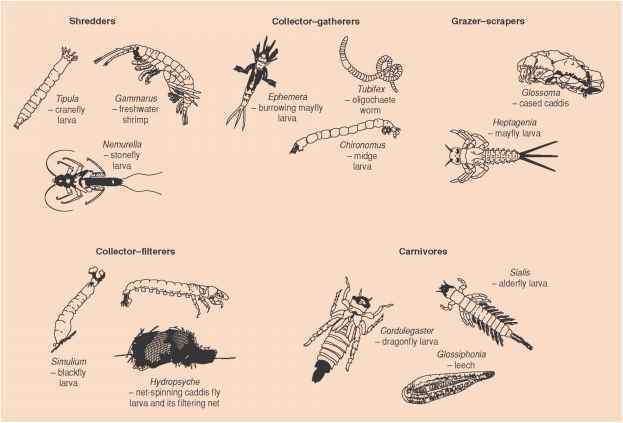 A number of classifications of habitat types have been proposed (e.g. Schaffer, 1974; Grime et al., 1988; Silvertown et al., 1993), but a review of these is beyond our scope here. Instead, we classify habitats by focusing on fitness contours, and hence on the ways in which present reproduction and growth combine to determine fitness in different types of habitat (following Levins, 1968; Sibly & Calow, 1983). For established individuals (i.e. not newly emerged or newly born offspring) two contrasting habitat types can be recognized. 1 High CR (cost of reproduction) habitats, in which any reduced growth that results from present reproduction has a significant negative effect on RRV, and hence on fitness. Thus, similar fitness can be achieved by combining high reproduction with low growth or low reproduction with high growth. Fitness contours therefore run diagonally with a negative slope (Figure 4.25a). 2 Low CR habitats, in which RRV is little affected by the level of present growth. Fitness is thus essentially determined by the level of present reproduction alone and will be much the same whatever the level of present growth. The fitness contours therefore run approximately vertically (parallel to the 'growth' axis; Figure 4.25a). This classification is comparative. In practice, a habitat can only be described as 'high CR' relative to some other habitat that is, comparatively, low CR. The purpose of the classification is to contrast habitats with one another. Figure 4.25 A demographic classification of habitats. (a) Habitats of established individuals can be either: (A) relatively high CR (fitness contours indicate that residual reproductive value rises sharply with increased growth resulting from decreased present reproduction) or (B) relatively low CR (fitness contours largely reflect the level of present reproduction). (b) Habitats of recently produced offspring can be either: (C) relatively offspring size-sensitive or (D) relatively offspring size-insensitive. Larger offspring size is assumed to imply a smaller number of them (for a given reproductive allocation). Hence, for example, in (D), fitness largely reflects the number of offspring - not their individual size. (c) By combining these two contrasting pairs, the habitat of one organism over its whole life, compared with another organism, can be of four basic types, arbitrarily referred to as (i)-(iv) in the figure. Moreover a habitat can be of a particular type for a variety of reasons. Habitats can be relatively high CR for at least two reasons. 1 When there is intense competition amongst established individuals (see Chapter 5), with only the best competitors surviving and reproducing, present reproduction may be costly because it reduces growth and hence substantially reduces competitive ability in the future, and thus reduces RRV. Red deer stags, where only the best competitors can hold a harem of females, are a good example of this. 2 Whenever diminutive adults are particularly susceptible to an important source of mortality from a predator or some abiotic factor, present reproduction may be costly because it maintains adults in these vulnerable size classes. For instance, mussels on the seashore may, through reproductive restraint, outgrow predation by both crabs and eider ducks. On the other hand, habitats can be relatively low CR for at least three different reasons. 1 Much mortality may be indiscriminate and unavoidable, so that any increase in size caused by reproductive restraint is likely to be worthless in future. For instance, when temporary ponds dry out, most individuals die irrespective of their size or condition. 2 The habitat may be so benign and competition-free for established individuals that all of them have a high probability of surviving, and a large future reproductive output, irrespective of any present lack of reproductive restraint. This is true, at least temporarily, for the first colonists to arrive in a newly arisen habitat. 3 A habitat may be low CR simply because there are important sources of mortality to which the largest individuals are especially prone. Thus, restrained present reproduction, by leading to greater size, may give rise to lowered survival in future. For instance, in the Amazon, avian predators preferentially prey upon the largest individuals of certain fish species. A related classification of habitats for newly born offspring can also be constructed. Again, there are two contrasting types (Figure 4.25b), assuming that, for a given reproductive allocation, larger offspring can be produced only if there are fewer of them. 1 'Offspring size-sensitive' habitats, in which the reproductive value of individual offspring rises significantly with size (as above, either because of competition amongst offspring, or because of important sources of mortality to which small offspring are especially vulnerable). An increase in size implies a significant rise up the fitness contours. 2 'Offspring size-insensitive' habitats, in which the reproductive value of individual offspring is little affected by their size (as above, because of indiscriminate mortality, or because of superabundant resources, or because there are sources of mortality to which larger individuals are more prone). An increase in size implies a negligible move up the fitness contours. Together, clearly, the two contrasting pairs can be combined into four types of habitat (Figure 4.25c).